Green building principles have been around for a while now, however, regulations, rule and practices are just beginning to become the norm. By helping your company transition into a more environmentally friendly way of building, you’ll be setting your company up for success in the future, as consumers become more conscious, and helping to increase your bottom line in the present. The green building movement will continue to gain momentum and may even become the norm for construction standards in the future. The positive impacts of this style of building are large and will go a long way towards helping to build a more efficient and resilient construction industry. Who wouldn’t want to live in a home or work in an office building like that? The future of the construction and real estate industries are sustainable homes. This isn’t just being shaped by consumers. It’s being driven by federal incentives, local government policy and residential and commercial builders. All of these pieces are working together to help establish a green building movement. Green building is the process of using sustainable practices and materials to build a home or building. There are certain standards and benchmarks your building will need to meet if you’re looking to achieve varying levels of certification. Greener homes are also seen as being better long term investments than conventional homes. This means the prices of these homes will end up being higher than conventional homes as well. How Does Green Building Effect Efficiency? Green building practices can help you to build not only more efficient buildings, but have more efficient and streamlined processes as well. For construction management purposes, it’s crucial to nail down your processes as soon as possible so you won’t be scrambling when green building regulations start to become the norm. Engineering and design are a big part of the green building process. Although the costs of green building may be a little higher, you can actually offset those costs by good design. With good engineering and design, you can actually use less materials and have less waste, which can end up driving down the overall project cost. Buildings that are green are also more energy efficient. The materials they’re made out of have less of an environmental impact, and the buildings usually have lower energy costs. This can be achieved through energy efficient lighting, temperature regulation and energy consumption. Using green building materials is absolutely crucial to building a sustainable home. Green building materials offer greater design flexibility, energy conservation, reduced maintenance costs, and improve the health of the building occupants. Green building materials also help to promote the conservation of non-renewable resources. As opposed to conventional building materials, green building materials are composed of renewable resources and are more environmentally responsible. • Recycled content: products need to be composed out of recycled content. • Natural: materials need to be harvested from sustainably managed sources and are certified by an independent third party. • Efficient manufacturing process: products needs to be manufactured with processes that are resource efficient. • Local: Building materials or components that are found locally or regionally are preferred. • Salvaged or refurbished: This includes materials that are saved from disposal, renovations, and improved upon in some way. • Reusable or recyclable: The products are enclosed in recyclable packaging or made from recyclable content. • Durable: Products and materials have longer than average life-expectancies. • Non-toxic: Materials that emit no carcinogens, irritants, or any other negative health factors as proven by the manufacturer. • Minimal chemical emissions: Materials and products that have low VOC emissions. Products that have minimal chemical emissions while increasing energy efficiency are also preferred. • Moisture resistant: Products and materials that either resist or inhibit moisture and the growth of harmful contaminants. • Low VOC during assembly: Systems that are installed with minimal VOC producing methods are preferred. • Healthfully maintained: Products or materials that can be maintained through simple, non-toxic methods of cleaning. Green building materials are then chosen individually based upon the above criteria. The materials are selected based upon the environmental goals of the project. 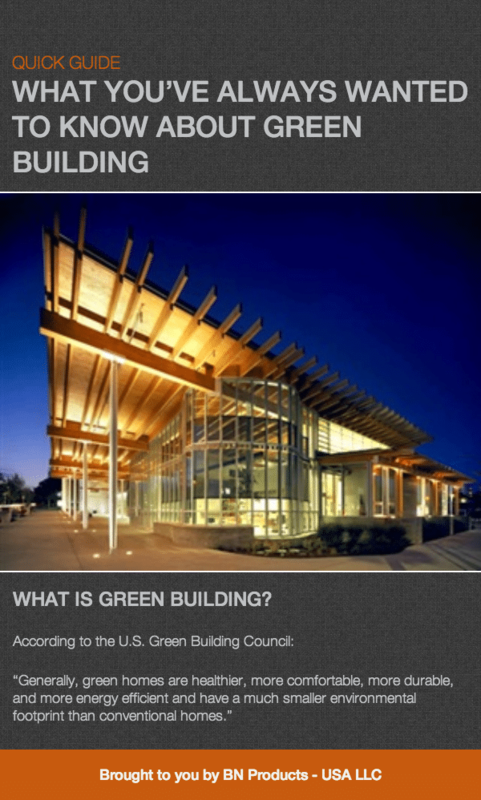 Why Are Green Buildings Important? Green buildings have a large scale impact on the economy, environment and world as a whole. As green buildings continue to reduce the overall impact of the built environment, the amount of positive influence will continue to grow. Green buildings are designed in order to save energy, resources, recycle material, and minimize the use of toxic substances. Overall, this can create a wholly positive effect on the natural environment. Green buildings seek to align themselves with local cultures and ecosystems as opposed to building against the current grain. Green buildings can actually improve the health and quality of life of its inhabitants, while reducing its overall impact on the environment. Green buildings can actually improve the productivity of the workforce, and help to induce operational savings. Green buildings can also say a lot about the person you are, or the company you run. It sends the message that you are being responsible, and committed to the future. With all of these elements combined, green building can help to change a very resource intensive industry. It will take time, but green building appears to be the future. Green building will continue to set the pace for the future of the construction industry. By getting your company ready to make the leap into green building, you’ll be seen as a leader of your industry, instead of trying to play catch up in the future. Start paving the way for your industry today by considering green building practices and more efficient and effective professional contractor tools to get you there.